Precious metals futures ended sharply lower Monday. Palladium and silver led declines with respective percentage losses of 4.9% and 3.4%. Gold finished at a more than one-month low. Gold for June delivery dropped $14.30, or 1.1%, to settle at $1,324 an ounce on the Comex division of the New York Mercantile Exchange. The settlement is the weakest since March 21. "The metals sold off in the face of an appreciating U.S. dollar on the world foreign exchange market," Jim Wyckoff, a senior analyst at Kitco Metals Inc., said in a report. "The U.S. dollar index hit a more-than-three-month high today. There is also little risk aversion in the marketplace at present, which is another bearish element for the precious metals markets." 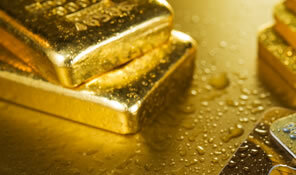 Gold futures ranged from a low of $1,323.80 to a high of $1,337.60. They slipped last week by 0.7%. Silver for May delivery plunged 57.6 cents to close at $16.587 an ounce. Silver futures traded between $16.58 and $17.14. They surged 3% last week. Last Wednesday, they settled at $17.248 an ounce for their best close since Jan. 26. July platinum fell $9.40, or 1%, to $922.40 an ounce, ranging from $917.30 to $931.10. Palladium for June delivery sank $50.65 to $979.55 an ounce, trading between $966.25 and $1,027.10. Last week, platinum dipped 0.1% while palladium jumped 5%. Last week, LBMA metal prices were mixed with advances of 3.7% for silver, 0.4% for platinum and 4.6% for palladium and a loss of 0.5% for gold. Interest rates go up, precious metals go down. Past performance is not an indicator of future results.